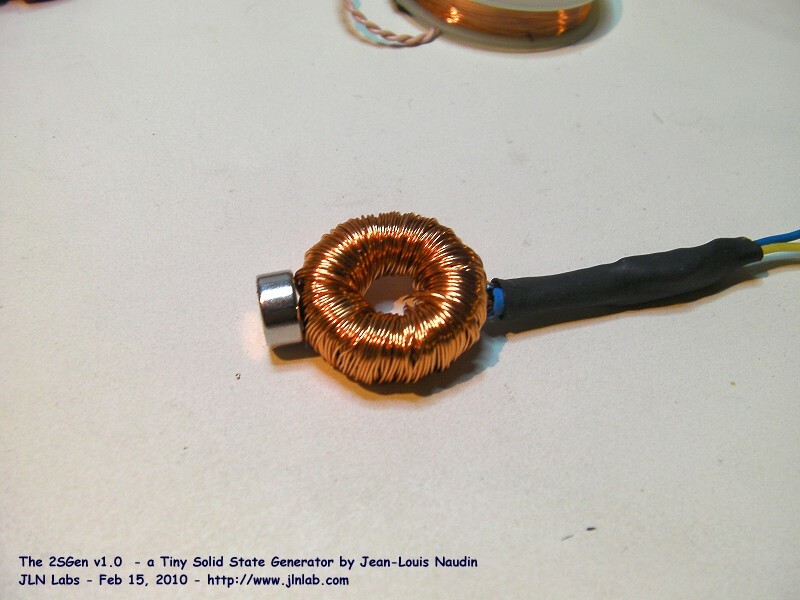 2SGen v1.0 is an amazing Solid State Generator very simple to build, you will observe some very interesting results about the properties of a toroidal coil with a ferromagnetic core when it is used with a neodymium magnet. 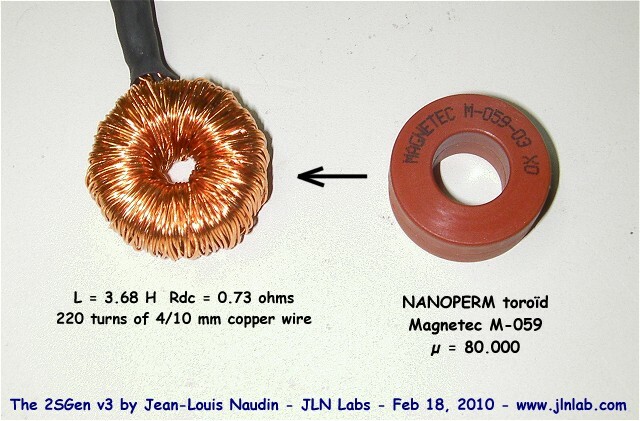 The output coil is a air core flat coil (OD: 42, ID:18mm, TH: 8mm) inductance=636 mH, Rdc=990 ohms made with 450m of 0.1 mm diam copper wire. 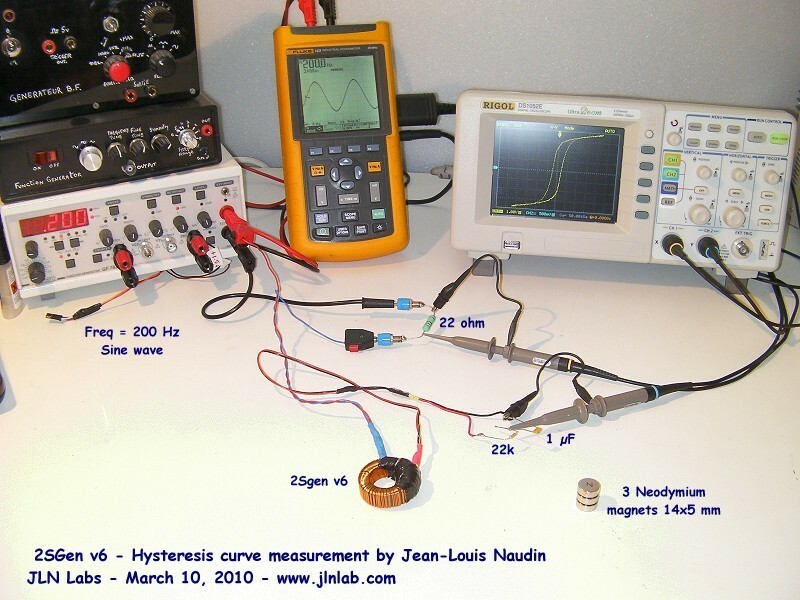 The frequency is also important, in this case 200 Hz is the best ratio, too high frequency increases hysteresis losses in the core. 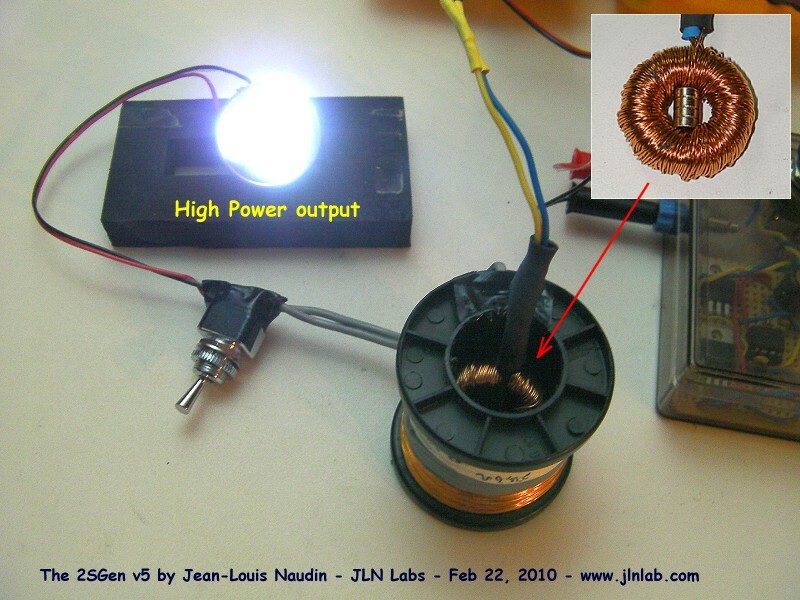 Above, the full diagram of the S2Gen v2, no external pulse generator is needed. 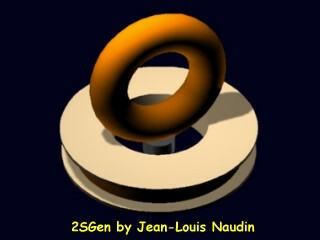 2SGen Episode 3: "the moving magnet experiment"
so has the magnetic lines are closed inside the toroïdal core. 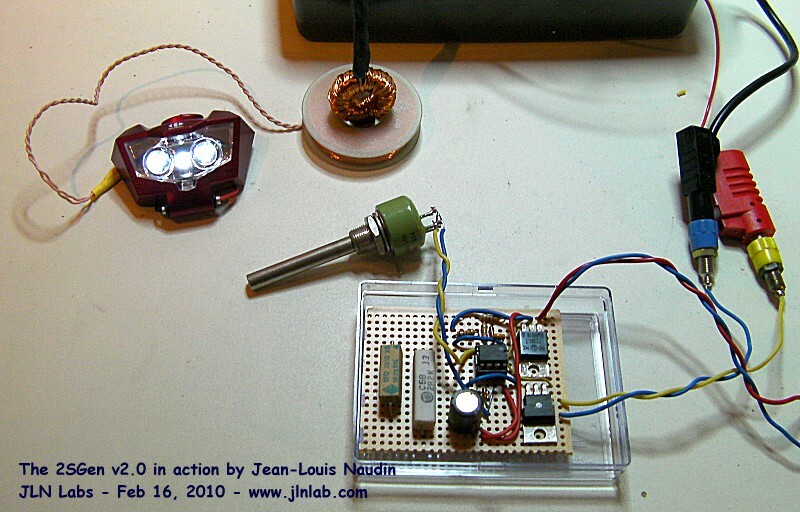 With this new setup, there is more OUTPUT power without change at the input. 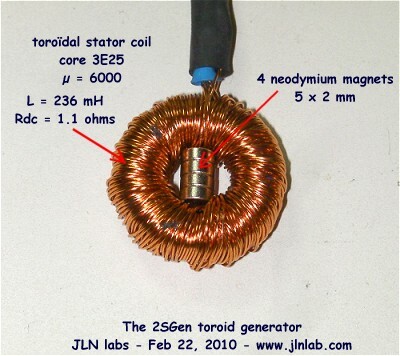 The toroïdal 2SGen coil has also been fully inserted in a cylindrical air coil. 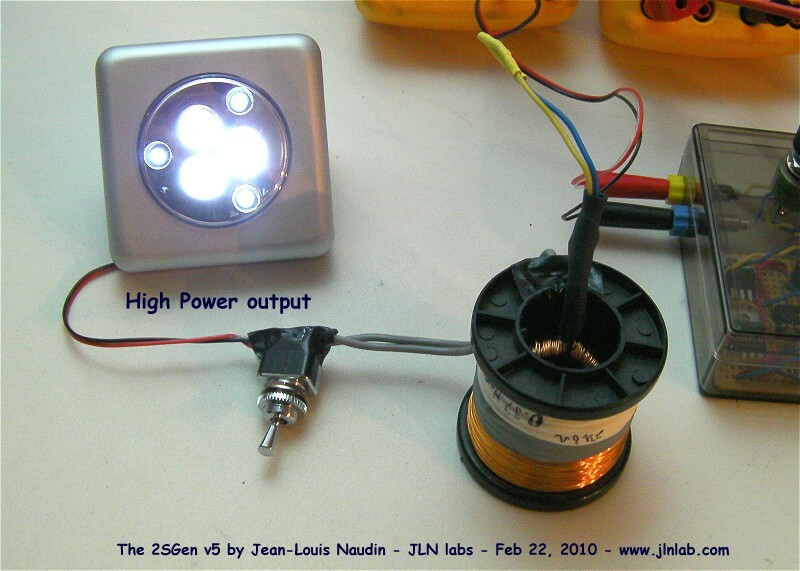 the blue curve is the pulse measured across the output coil connected to a lamp as a load. Look at the blue curve, the first part (negative curve) is the magnetization phase of the core (building up of the magnetic energy), you may notice some Barkhausen effect bumps. 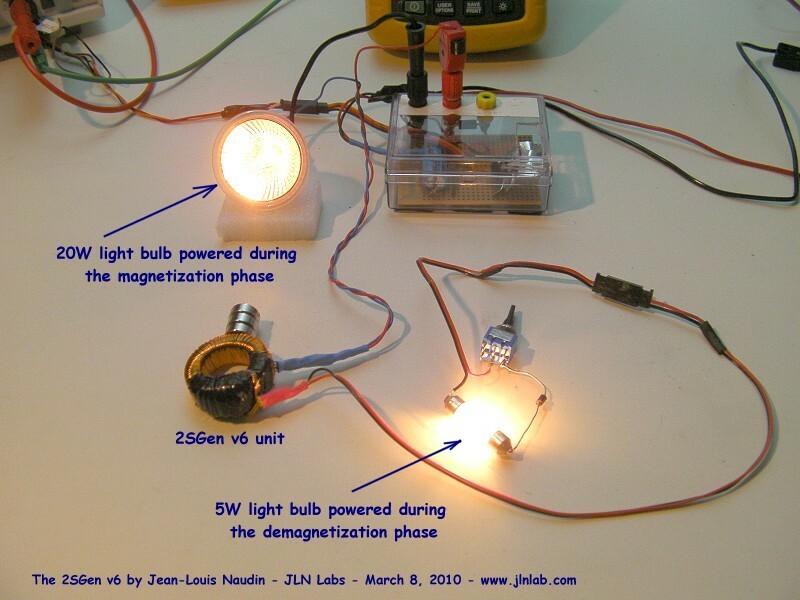 The second part (positive curve) is the demagnetization phase of the core. 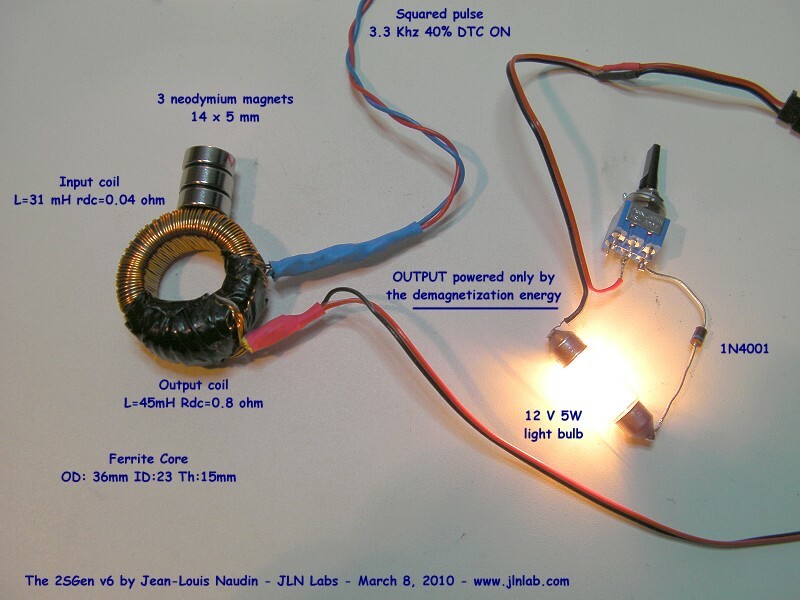 The excess free energy is tapped during the demagnetization process and not during the magnetization process due to the blocking diode connected at the output coil. 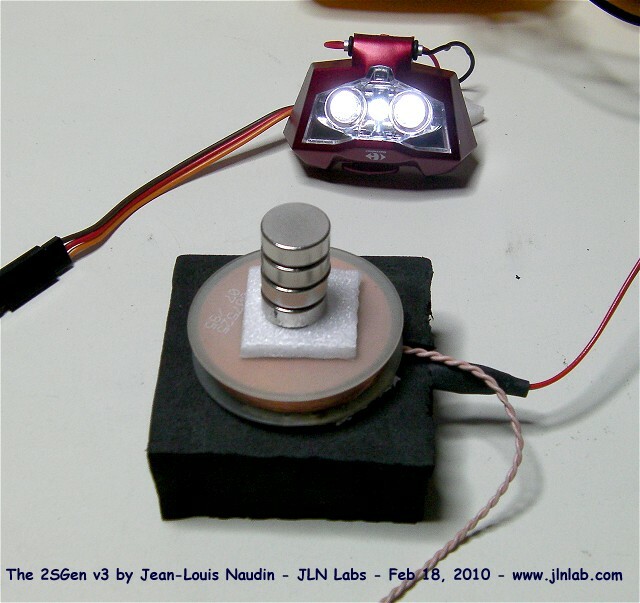 To get more free energy from the 2SGen device, the clock pulse must be shorter as possible (during the magnetization process). 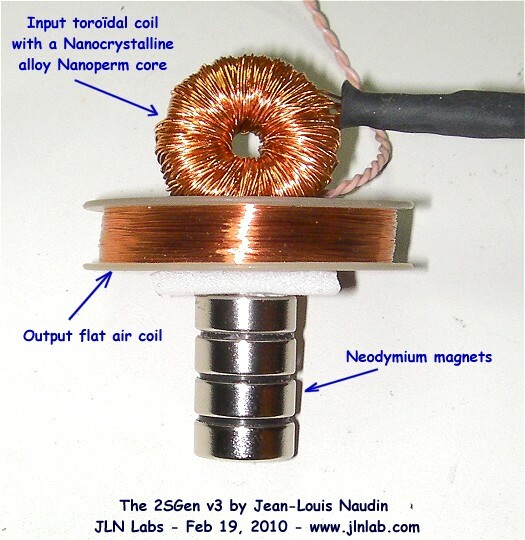 The process of free energy generation from magnetization/demagnetization of a ferromagnetic core has been fully explained in the Nikolay E. Zaev paper "Ferrites and Ferromagnetics Free Energy Generation" published in New Energy Technologies Issue #5 Sept-Oct 2002. 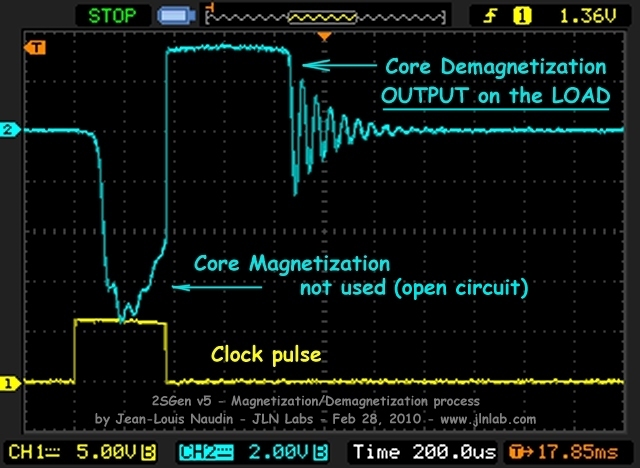 The pulse period must be greater than the time of the magnetization/demagnetization process, here 1500 µs. 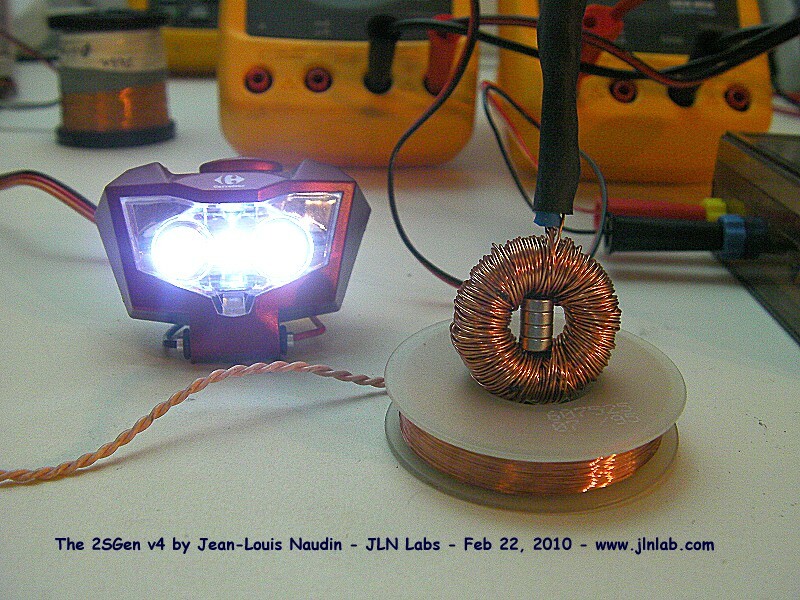 The output coil must be fully EM decoupled from the input coil (no mutual inductance), so this why the toroïdal coil is used as the input coil and a cylindrical or a flat coil set at 90° as the output coil. 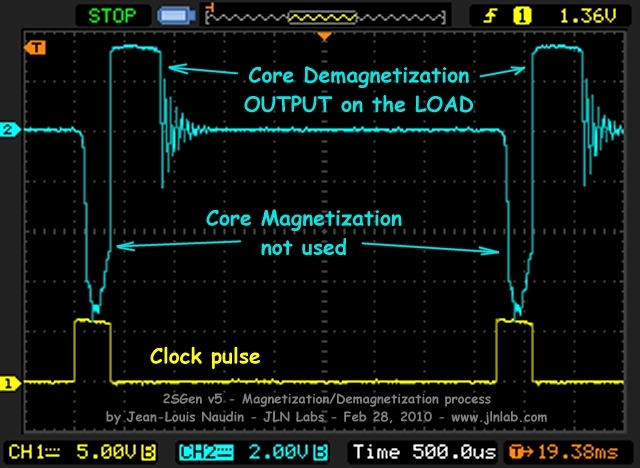 Shorter the clock pulse (low DTC) is, lower the energy spent for the magnetization process will be. 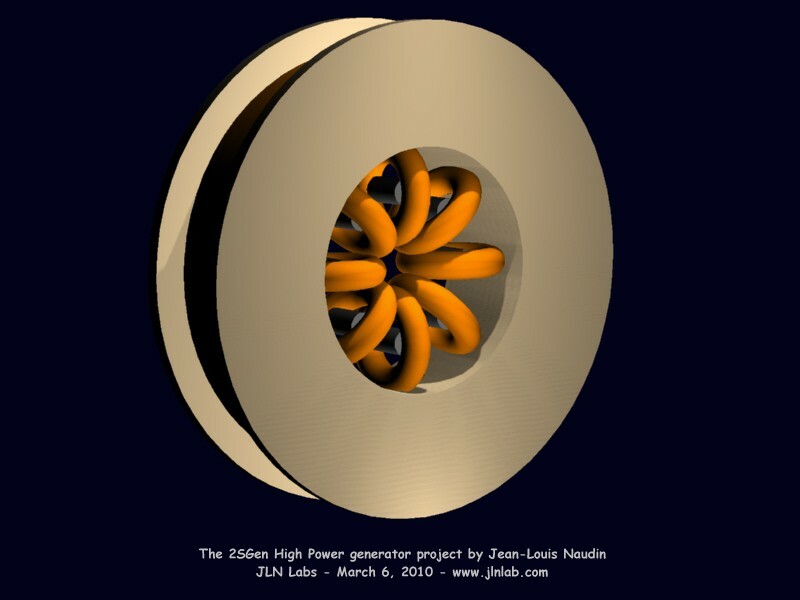 The 2SGen is not a transformer: The excess of energy tapped on its output comes from the magnetic material itself (during the demagnetization process). 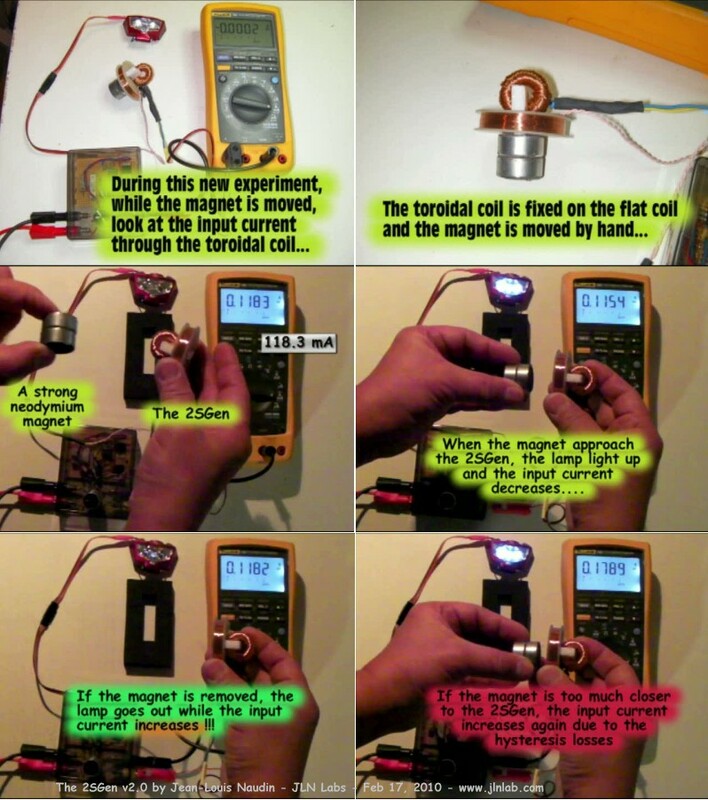 The volume of the ferromagnetic core used is important to get more power: greater the volume of the core is, higher the power at the output will be. 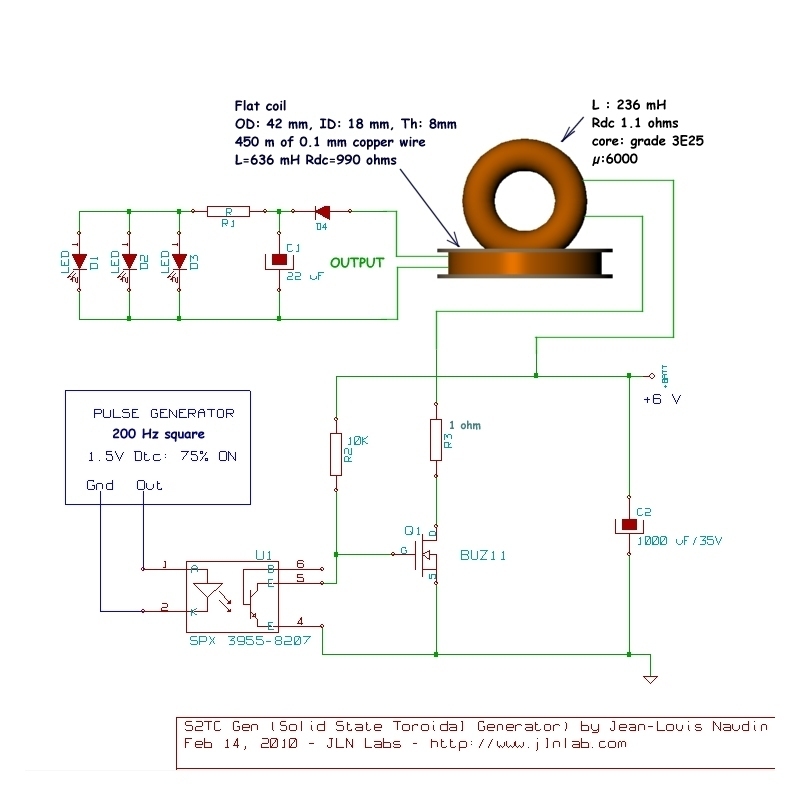 The pulse period must be greater than the time required for the magnetization/demagnetization process and this is fully dependent of the performance of the magnetic core used. 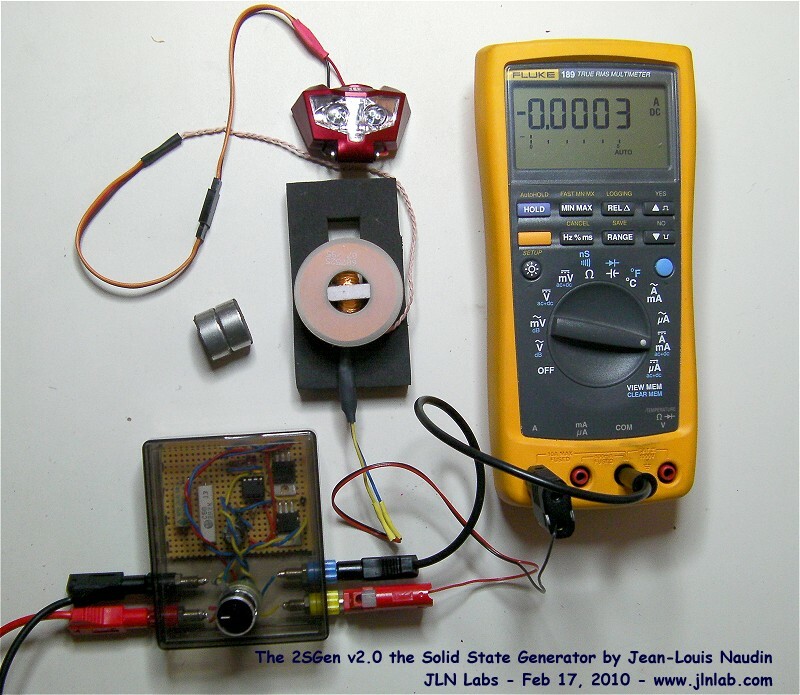 The best tuning is done when there is no change in the measured DC input power while the output coil is loaded. Don't forget that energy of the magnetization pulse is the cost to be paid for obtaining the excess energy from demagnetization. 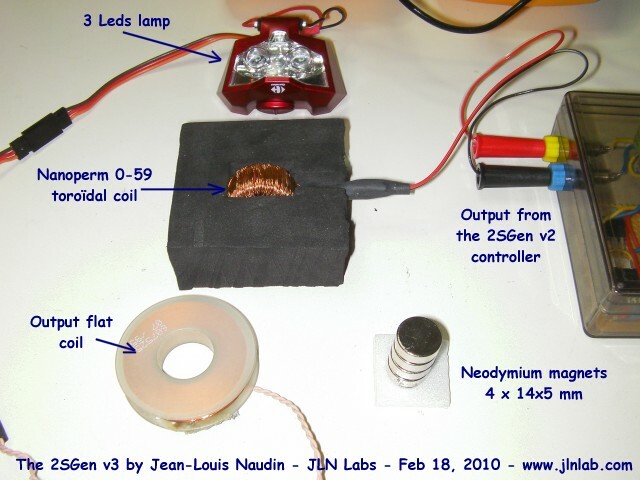 You will find below a 2SGen v5 simulation with FEMM with a Nanoperm M-059 core with the same setup used in the real working prototype. Above, the hysteresis curves of the toroïdal core at 200 Hz sine wave. 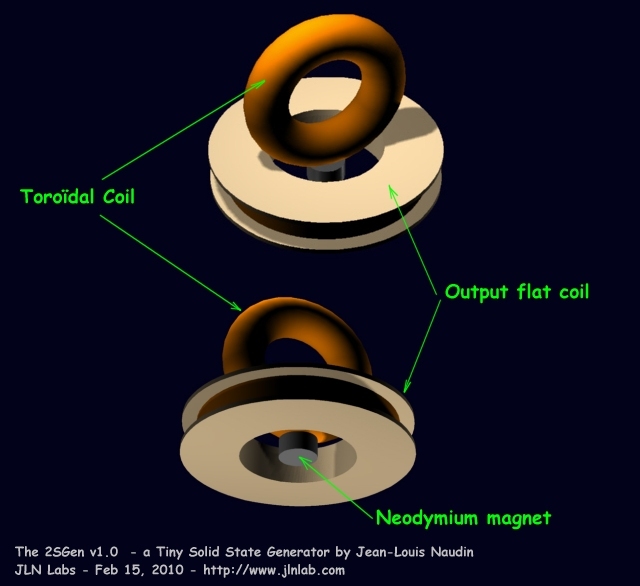 You may notice that the hysteresis curve begins nearly flat when the magnet is close to the toroïdal core. In this case the permeabilty of the core begins very weak. Above, the hysteresis curves of the toroïdal Nanoperm M-074 core at 200 Hz sine wave. "Ferrites and Ferromagnetics Free Energy Generation" from Nikolay E Zaev published in New Energy Technologies Issue #5 Sept-Oct 2002.